I'm pretty sure these were for sale on the Samsung website and now they aren't, what gives? I noticed that as well, I was debating between this and the fabric cover, then these disappeared. I found them on B&H, but still as a preorder. Yes I want this one as well. The Android Central store has them on pre-order as well. Another thing Samsung does poorly is accessories, they never have their stuff ready for launch. 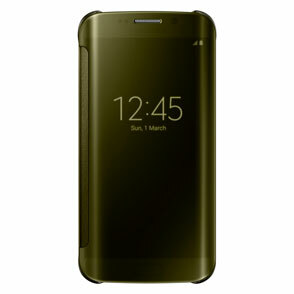 i'm glad this s6 edge clear view cover is not cancelled ! it' on amazon too, ship and sold by Amazon. "Usually ships within 1 to 2 months"
i guess it' not ready yet. Samsung website is saying available 4/30. Would like to see this one in person or at least read some reviews before ordering though. I bought one off eBay for $8, will let you know how it works. How do I connect to chromecast via a set top box? Why is my touch screen not working on my Samsung Galaxy 2 10.1 tab? Is the Verizon Edge Unlocked when bought on Contract? Why doesn't my phone receive signal?